My daughter was a wayward angel. She was three years old; the youngest child in the Christmas pageant. Shepherds, angels and wise men flocked around the manger on the chancel steps as they faced the congregation. Behind them, under the vaulted Gothic ceiling was the stable and a large gilt star on a pole. My daughter, the littlest angel, suddenly broke rank. She hopped off her step, and began to amble around the front of the church. She inspected the poinsettias that were carefully arranged at the chancel steps, and waved at people she knew in the congregation, oblivious to efforts of the older children to get her back in her place. No one minded; it added to the atmospheric charm of Christmas Eve. Yet once Christmas is over, we are not sure what to make of angels – at least those of us who have moved beyond the Christmas pageant stage in our faith development. Some of us may still be intrigued by the idea of unseen spiritual beings at work behind the scenes, but we are not inclined to probe the matter further. After all, how are we to correlate the existence of unseen spirits with the rationally ordered worldview of modern science and the fruits of empirical investigation? John Spong delights in theological provocation. Most modern interpreters of scripture are more circumspect, and would not deny outright the existence of angels. Nevertheless, it has become a commonplace for the more liberal Bible scholarship to treat scriptural texts that speak of angels as fanciful elaboration, fictional embellishments added in order to make a theological point. 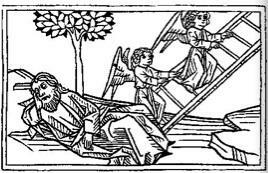 The underlying presupposition is that angelic beings are by definition fanciful and hence their appearance in the narrative inevitably reflects an imaginative insertion by the biblical writer. While liberal scholarship is uncertain about angels, popular culture displays a continuing interest – but at the cost of trivializing angels. We have made angels cute and innocuous, like the cherubic infants depicted in baroque painting and statuary. Greeting cards and inspirational prints render them as ethereal beings of uncertain gender, dressed in gauzy white robes as they clutch golden harps and hover in mid-air. Then there are the Hollywood angels; the earnest do-gooders from “Its Wonderful Life,” or “Heaven Can Wait,” or John Travolta’s dysfunctional angel, “Michael” – carousing away his time on earth and awkwardly trying to hide his large wings under his coat. Angels have become New Age spirit guides with little connection to the biblical narrative. A few years ago a friend who calls herself a “Post-Christian” took a course on how to communicate with angels for spiritual guidance – but without reference to Jesus or scripture. More common are the plethora of anecdotal accounts in which mysterious persons – taken to be angels – appear at just the right time in a crisis and then disappear just as mysteriously. 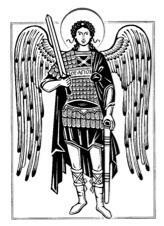 Increasingly angels have become a conveniently non-sectarian cipher for benevolent spirits that we can turn to for help. The common denominator is that none of these versions of angels bear much resemblance to angels as they appear in the Bible. The result is their trivialization, since they become whatever we want them to be – markers of our spiritual longings, perhaps, but entirely apart from the robust and incisive role that they play in the biblical drama of salvation. The recognition that creation includes the unseen spiritual world as well as the immediate physical world is the basis for our understanding of angels. Angels populate this unseen but created spiritual world that we refer to as “Heaven.” Yet what makes angels significant for us is the fact that they are not limited to the heavenly sphere. They traverse the distance between the heaven and earth. In biblical Greek, an angelos is a messenger. As messengers, angels function as intermediaries. They effect the intersection of heaven and earth – which lies at the core of God’s redemptive purpose. Yet as incorporeal spiritual beings, the angels are curiously able to assume physical form within in the human sphere – a capacity that flows from their vocation as messengers and mediators of the gulf between heaven and earth. Here lies one of the most intriguing aspects of the angelic nature: a certain transparency in regard to the presence and utterance of God. Their activity is so entwined in God’s redemptive purpose, that in those narratives in which angels appear to human beings, it is not always clear to the reader whether the speaker is the angel, or the LORD Himself. According to Genesis, “They said to him, ‘Where is Sarah your wife?’” When Abraham indicates that Sarah is in the tent, the response comes not from the “they” of the preceding question, but from “The LORD.” Has the LORD suddenly appeared and taken over the conversation initiated by the three visitors? Or is the LORD actually one of three visitors? This might seem to be indicated by the fact that after dinner, two visitors depart for the city of Sodom while “the LORD” remains and converses with Abraham. It is at this point that Genesis tells us that the two travelers to Sodom are actually angels; but what of the third? Is the third the LORD himself in human form? Von Rad concludes rather that “Yahweh appeared in all three.” None of the three are “The LORD,” as such. 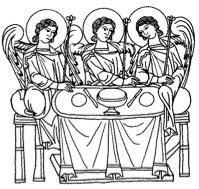 But as angels, the three visitors are so transparent to the presence of God that God is able to speak and act through them. The biblical role of angels extends beyond their functioning as message-bearers to an active involvement in the human sphere. Operating behind the curtain that separates the seen and unseen, angels act on behalf of the people of God. The popular notion of “guardian angels” has biblical foundation in the words of Jesus, “See that you do not despise one of these little ones, for I tell you that in heaven their angels always see the face of my Father who is in heaven,” the possessive case indicating a personal association between the human and angelic. Similarly, when Peter is miraculously released from prison in Jerusalem, he goes to the home of Mary, the mother of John Mark. His friends do not believe it is really him. “It is his angel!” they say, indicating a common belief in New Testament times in angelic guardian spirits. More often the Bible speaks of angelic involvement in broader more collective terms. The angels contend for Israel as a people, or for the Church. The Book of Daniel depicts the Archangel Michael as the “the great prince who has charge of [God’s] people” as he contends with the “prince of the Kingdom of Persia,” – who, like Michael, is not an earthly king but of one of the “powers and principalities” operating behind – or over and above – the sphere of earthly history. In the Second Book of Kings, the Syrian King goes to war with the King of Israel, but his adversary seems to anticipate his every move. A spy tells him, “Elisha, the prophet who is in Israel, tells the king of Israel the words that you speak in your bedroom.” So the Syrian army surrounds the city of Dothan where Elisha is living. Elisha’s servant wakes up that morning in terror. “Alas, my master!” he says, “What shall we do?” The prophet responds, “Do not be afraid, for those who are with us are more than those who are with them.” Then God opens the servant’s eyes, “and behold, the mountain was full of horses and chariots of fire all around Elisha.” This is the “Host of the Lord” – not an angelic choir, but a great army, mobilized to contend for God’s people.